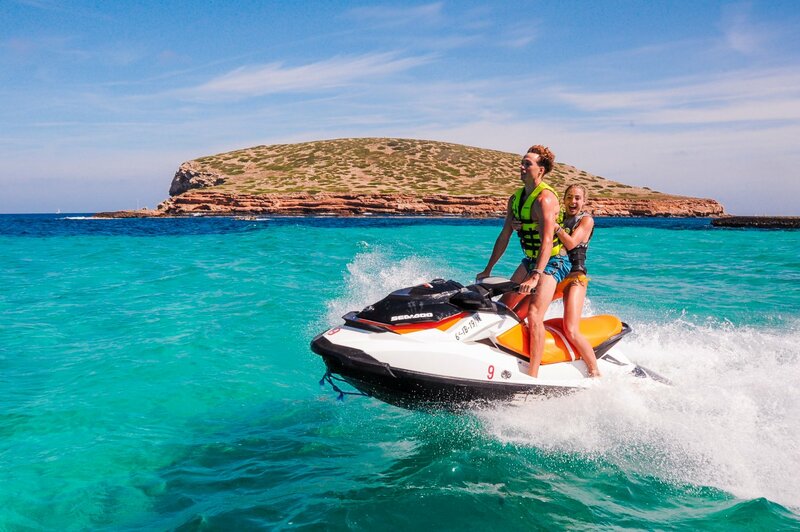 Take an adrenaline-filled jet-ski ride over the crystalline waters of Ibiza with Ibiza Jet Ski, direct from San Antonio’s harbour area. Ibiza Jet Ski is also located at Cala Bassa Beach. Their guided tours take you to some of the most stunning spots of Ibiza, cruising past beautiful and rugged coastline, with the help of their professional instructors. You don't need a licence to go on one of our jet-ski tours, just yourself and a willingness to go on an exciting adventure. You can choose from a variety of tours, with location decided according to wind conditions. A 30-minute beach tour will take you to one of the heavenly beaches of Ibiza's west coast, Cala Tarida or Cala Salada. The 60-minute trip will take you to the magical islands of Es Vedra or Islas Margaritas. For those that want a longer 90-minute tour, you will be taken to either the jaw-droppingly beautiful Atlantis, hippy haven and site of wonder; or the dramatic Puertas del Cielo, or ‘Heaven's Gate' in the north of the island. Booked online, took water taxi from otherside of bay over to meeting point, where you take a speedboat out to the jet ski's. Following your guide you go at speed across the beautiful water at nearly 65mph, crashing into the waves, until you meet up again with everyone else at this little cove, slowing down for other boats in the area, you can take this opportunity to have photographs taken or enjoy the water. My advice, make sure you apply sun cream to the front of your body all over, (as the sun really hits your knees and thighs). You then make your way back towards where you got the jet ski's from, enjoying more of the open water and stunning view. The staff are exceptionally friendly, really happy to help and make it such a great experience. Fantastic experience and one more thing off the bucket list.